The Regional Unit of Kastoria is located at the west end of the Western Macedonia.It borders with E.E Florina, Grevena, Kozani and Ioannina, as well as with Albania on the west side. The town of Kastoria unfolds amphitheatrically at an altitude of 620 meters.It is build on a peninsula that penetrates Orestiada lake and bellow the impressive massif mountains of Grammos and Vitsi. The mountainous ranges of the Prefecture of Kastoria, Grammos, Vitsi and Voio, await for you to discover them in order to reveal to you their secrets. Forests and picturesque settlements of unique beauty accompany you to your journey. 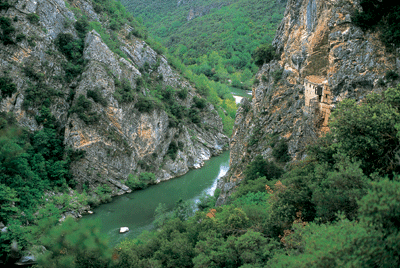 Gorges, rivers and lakes which constitute rare water lands, remain in this part of Greece a hospitable habitat for many endagered avifauna and fauna species. Apart form the natural beauties of these massifs and the activities offered tot the visitor, during the trips we suggest, you will have the chance to get in contact with the history and culture of the area, by visiting the traditional settlements with the special architecture. It is a modern city that has retained its traditional character and several Byzantine architecture.It is built on the shores of Lake Orestiada , the hallmark of the city and is a real gem for the whole E.E. Because of its morphology it is considered the most beautiful lake of Greece and has been declared "Monument of Natural Beauty". 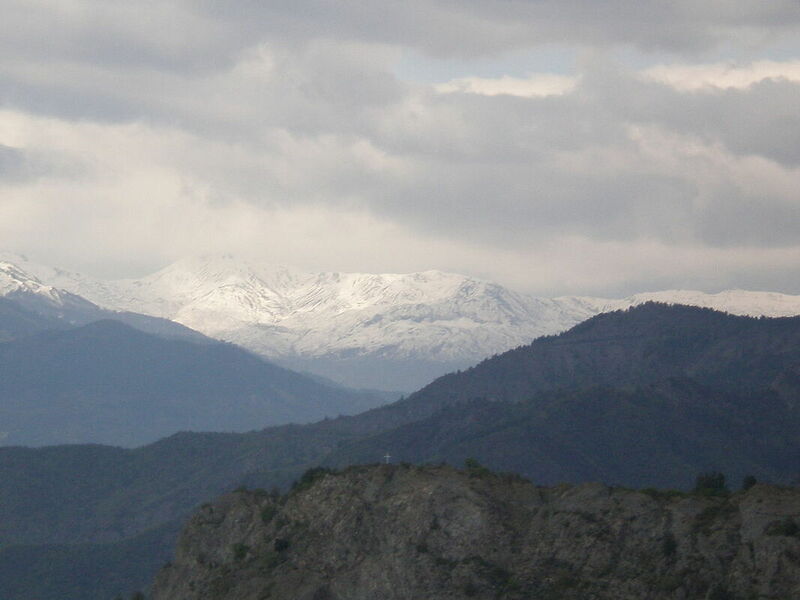 The beautiful nature of Kastoria offered both for winter and for summer tourism. Each visitor has the opportunity to observe in first hand the pristine nature and the diverce ecosystem. Skiing in snowy mountains or trips in the dense forests, while in summer, the green mountains and the blue of the lake are the perfect scene for both relaxation and exploration. In Kastoria there are today important monuments of Byzantine culture, such as walls, the Byzantine churches and old mansions with Byzantine architecture. Kastoria is also famous for the delicious food at the many restaurants in town. Also visitors can obtain local and tradiitonal products from different shops of the city. The cave is located on the north side of the city, on the 2nd km of Souggaridi lakeside road and shortly before reaching the Monastery of Panagia Mavriotissa. Its entrance is approximately 20 meters far from the lakefront and 14 meters far from the road. The inside of the cave is divided in large parts of land and water, both adorned with impressive decoration of stalactites. There are 7 underground lakes, 10 rooms and 5 corridor–tunnels in the cave. The largest room of the cave, which has dimensions of 45 meters by 17 meters, has a central part which extends above its lateral parts which both end up in lakes. The largest lake in the cave, which is also the deepest one, is on the west. The temperature inside the cave remains stable throughout the year ranging between 16-18oC, while the humidity reaches 90%. Various paleontological remains have been found inside the cave of the Dragon, the majority of which, though, are cave bear bones (Ursus Speleaus). This species lived in Europe during the Pleistocene epoch and became extinct about 10,000 years ago. Its name derives from the fact that fossils of this species are mostly found in caves, indicating that this species spent more time in caves than the brown bear which used the caves only for hibernation. It is estimated that the average weight for males was 400–500 kilograms, while females weighed 200–250 kg. They were primarily a herbivorous animal and occasionally a carnivorous one.It is worth mentioning that all necessary measures regarding the safety of the visitors have been fully taken and all necessary interventions inside the cave were performed in such a way as to ensure the stability of the Cave’s natural environment. Various paleontological remains have been found inside the cave of the Dragon, the majority of which, though, are cave bear bones (Ursus Speleaus). This species lived in Europe during the Pleistocene epoch and became extinct about 10,000 years ago. Its name derives from the fact that fossils of this species are mostly found in caves, indicating that this species spent more time in caves than the brown bear which used the caves only for hibernation. It is estimated that the average weight for males was 400–500 kilograms, while females weighed 200–250 kg. They were primarily a herbivorous animal and occasionally a carnivorous one. It is worth mentioning that all necessary measures regarding the safety of the visitors have been fully taken and all necessary interventions inside the cave were performed in such a way as to ensure the stability of the Cave’s natural environment. Aquarium of KastoriaIt is the largest freshwater aquarium in the Balkans. In the aquarium hosted endemic and native species of fish of almost all the rivers and lakes of Greece, and a large number of alien fish species living in lakes Ellados. The aquarium includes 49 representations liquid habitats. Special place is the two largest exhibits of Kastoria lake and river Aliakmona. Visitors can enjoy several of the endemic species such as whitefish to Epirus, o lourogovios the Peloponnesian and the Macedonian Branagh, the Balkan Briana, chub, the potamokefalos Morea and Pamvotidas Ioannina. The pride of the aquarium, however, is the sturgeon. This species, according to the Red Book of endangered species, classified as Critically Endangered. The rare fish is known for its eggs, from which are produced the expensive black caviar. The Aquarium Kastoria, aims to provide awareness and informing the public on the diversity of species and habitats of fish. The archaeological site of Dispilio and the Eco-museum are 7 kilometres from the city, on the south side of the lake. A lake settlement of the Neolithic Era, developed around the lake from the middle of the 6th millennium BC to the middle of the 4th millennium BC has been excavated here. Eco-museum that has been integrated in “Life” program since 1996 and is open to the public since 2000, is an attempt to represent the settlement. It gives the opportunity to the visitor to better approach the way of living of its inhabitants. In the space of the museum, there are huts built on pile platforms, constructed in their normal size and with materials that are similar to the original ones. Tree trunks were used for the shell, thin branches stranded with rope for the walls, lake mud for the “plaster” and straws for the roof. In the interior of these houses of the lake’s Neolithic people, one can see everyday-life objects. Earthen pots, such as bottles, mugs, fruit bowls and kettles, tools made of firestone or bones, baskets and a small fire place give a clear picture of the life and the activities of the inhabitants. Fishing, hunting, earth cultivation and stockbreeding were their main activities. The eighty churches date back to the 9th to the 14th century. They are built inside and outside the city walls and they are masterpieces of Byzantine art. They are classified as three-aisled vaulted basilicas, longitudinal hall churches with wooden roof and more rarely as domed triconch church. Their wall structure is very characteristic. The walls are made of stones that are surrounded by mud-bricks, as well as mud decorative elements, usually representing suns, circles and monograms. The stone bridges are masterpieces of traditional architecture and an integral part of the landscape of Kastoria. The bridge of Zouzouli is surrounded by dense forest and high peaks, away from any road or any pathway. However, until World War II, the bridge of Zouzouli was on the main path linking Western Macedonia with Epirus. It used to link the village Zouzouli, north-west of the bridge, with Grevena and Tsotyli. It is one-arched, 25 m long and 7m high. According to some, it was constructed by builders from Mastorochoria of Konitsa, in 1880, and it was funded by a mule-driver from Fourka in Konitsa, who have lost his brother in the violent waters of the river. The Bridge of Kousioumplis is located between the mountains of Voios and Smolikas on the river of Zouzouli. It used to link the villages of Zouzouli and Eptachori and it was built in the late 16th century. This one-arched bridge, with its reinforced side openings, has an arch opening of 14m, and it is 8m high, 33m long and 2,40m wide. On its key, that is the middle stone of its arch, one can see a stone-carved head. In 1992, maintenance works took place in order to protect the bridge from wear as well to restore its initial form. The bridge of Koromilia is built about one kilometre north from Koromilia village of Kastoria, on a river called Ladopotamos. It is one-arched, with stone structure made of limestone that is abundant in the area. It is 26m long, 2.80m wide, 7m high and its arch opening is 16 m. On its north-western side, to the east of the key, there is a stone that is carved and shows the date of construction (1865). The bridge in Beriki is on Ladopotamos River, south of the villages Gavros and Kranionas. The bridge is one-arched and it has a rather sophisticated construction: the arch - very thin to avoid extra weight - is lifted very high somehow sharply in order to cover the distance between the rocky outcrops of the slopes, where the bases of the bridge stand. It was built, probably in 1866, by the master builder, Sdrolios, from the neighboring village of Debeni (now called Dendrochori). The bridge of Palia Kotyli is one-arched and it was built of stone in the 19th century. The one-arched bridge of Eptachori, built in 1900, is inside the village. On the mountainous cluster of Vitsi, the exquisite beech forests of rare flora and fauna are ideal biotopes for many species of animals and plants, some of which are endangered. The bleak landscape and the traditional, picturesque settlements "strewn" on it's slopes, invite you to a journey of pleasurable exploration. In addition, for those who love skiing, there is facilities on the mountain, of a well organized ski center which runs at 1,800 meters above sea level. Nestorio, one of the oldest settlements of Kastoria. From its natural citadel, the Castle, the impressive view of Gramos and Aliakmonas unfolds. On the hill of the Castle cultural events are held during the summer, organized by the Municipality. The main attractions in the town are the church of the Almighty Archangels, the iconostasis of which has been characterized as a masterpiece of ecclesiastic Art. Moreover, from the region of Nestorio, passes an offshoot of the international walking path E6, making this area a hikers heaven! On the west of the Prefecture, spreads the commanding cluster of Gramos wich coexists in harmony with the springs of the biggest river in Greece, Aliakmonas. Along the river banks hydrotopes are formed, hosting mny flora and fauna species which are differentiated according tot the altitude. In this region the dreamlike plateau "Tsakarosa" is situated, which took its name from a spring. Its water according to the locals "weighs three houndred drams". 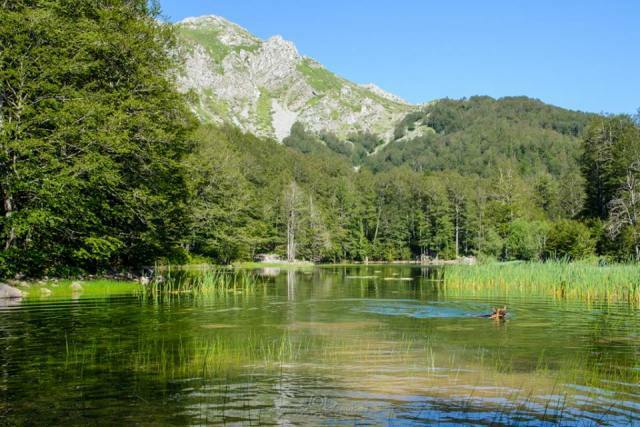 Here you will also enjoy the alpine lake Moutsalia with its water-lilies and its freezing waters, that look like grey-green granite and host a rare amphibian, the Apline Triton, a "small fish with legs", as the locals describe it. Route 3: Kastoria - Koromilia - Gavros - Kranionas - loose - Melas (Korestia). Route 4 : Kastoria - Mesopotamia - Dipotamia -Pentabrusos - Omorfoklhsia - Augh - Zeugostasi -Kastanofyto -Ontria. Route 5 : Kastoria - Korisos - Basileiada - Melisotopos - Kleisoura. Route 7 : Kastoria - Ampelokhpoi - Bogatsiko - Yerma. 1st - Little Round Lake: Doltso , Agios Nikolaos Monastery Mavriotissa, Transfiguration , yacht club , Tsiatsiapa mansion , Agios Athanasios - Tsardaki. 2nd - The large round lake: Dispilio - Lake Settlement , Gkioles bridges , Cesme, Lakos and Grkanovonta , Krepeni , Agios Nikolaos - Mavrochori, Polykarpi , Fotini , Metamorfosi , wall , Chloe. 3rd -Crossing the mountain Vitsi: Chloe , Aposkepo , Headboard , Sidirochori , Vyssinia , Beech , Vitsi Ski Center. 4rth - In the virgin forests of Grammos - Eptahori: Maniaki , Kolokynthou , Mesopotamia , Kalochori , Kranochori , Ptelea , Agia Anna , Nestorio , lines , Livadiotopi , Giannochor i, Monypylo , Slimnitsa , skirt , Grammousta , Arrenes , Pefkofyto , Golden , Zouzouli , Eptachori , New Kotyli-old, Kypseli. 5th - At Petrified Forest: Argos Orestiko , Amoudara , Botani , Dialechto, Belos , Asproklissia , Skalochori , Nostimo - Petrified Forest , Anthiro , Sphlio , Agios Ilias. 6th - In Korestia: leukh , Koromilia Korestia , Kranionas , Agios Antonios , Xalara , Makrochori , Melas Ano Melas. 7th -The north gate of Grammos: Mesopotamia , Agia kuriakh Inoi , Pteria , Polyanemos , Akontio , Xionato , Komninades , Dipotamia , Ieropigi , Dendrochori. 8th - At the foot of Audrey: Laxanokhpoi Lakomata , Asproneri , Krua Nera Zefgostasio , Kastanofyto, Caves , Melanthio , Braxos , Rock-Pond Dam , Nikh, Petropoulaki , Laga. 9th - Poria, Chiliodendro, Tsakwnh, Pentavryso, Omorfokklisias, Ypshlo, Aygh - Neolithic Settlement ..
10th - Ambelokipi , Militsa , Kostarazi , Vogatsiko , Germa - dam. 11th - Korissos, Basileias dam Klisoura. ​• Climbing the rocks of the castle in Nestorio , in village Vraxos , also in the old Kotyli in slope called "Charos". • Climbing the peaks: Grammos (2520m) from the village Grammousta , Kiafa (2398 m) Flampuro (1882m) . • Ascent of the canyon on the river Aliakmon (starting from the location of the River-Party in Nestorio) . Mountaineering : Test your stamina by climbing the peaks of Grammos (2.520 m) from the villagfe Gramousta of Kiafa (2.398m).And Flamburo (1.882m) .Climb the gorge of Aliakmonas , starting from the location of River-Party in Nestorio. • Rafting in Nestorio. Descent from the Aliakmonas River springs. • From Nestorio to Pefko, Lianotopi, Grammousta, Agio Zacharia, Arrenes.